Newcastle boss Alan Pardew has signed a contract extension that will keep him at the club until 2020. 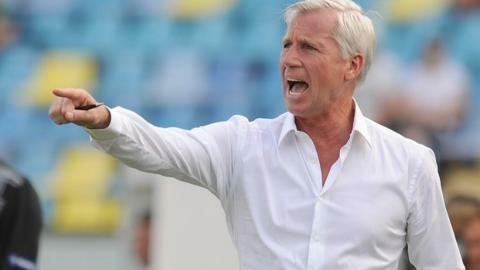 Pardew originally signed a five-and-a-half-year deal when he succeeded Chris Hughton in December 2010. However, the 51-year-old has been rewarded for guiding Newcastle to fifth place in last season's Premier League and a spot in the Europa League. Coaches John Carver, Steve Stone and Andy Woodman have also been given new eight-year contracts. In June, chief scout Graham Carr was given a contract to keep him at the club until 2020, when he will be 75. Managing director Derek Llambias said Newcastle want continuity to match English football's top clubs. "If you look at clubs like Manchester United and Arsenal, Sir Alex Ferguson and Arsene Wenger have shown that stability gives you the best platform to achieve success and that is the model we wish to emulate here," he commented. "We're looking to build on the success we had last season and these new contracts are aimed at keeping the club progressing on and off the pitch, as we have done since returning to the Premier League in 2010." Former Reading, West Ham, Charlton and Southampton manager Pardew was named the manager of the 2011-12 season by both the Premier League and League Managers' Association. He became the first Englishman to win both awards in the same season. Newcastle, who had finished 12th the previous season but been expected to struggle after losing several key players, won 19 of their 38 league games, keeping 15 clean sheets. Llambias added: "Alan has done a fantastic job over the last couple of years and has proved what a great Premier League manager he is. "I have total respect for him in all football matters and have an excellent relationship with him, which I think benefits the club enormously. "Alan also has one of the best backroom teams in the country and I would like to thank John Carver, Steve Stone, and Andy Woodman for all their combined efforts." The former Crystal Palace and Charlton midfielder started his managerial career with a four-year stint at Reading, which ended with him resigning and taking over at West Ham in 2003. After taking the Hammers to the 2006 FA Cup final he was sacked six months later and after spells with Charlton and Southampton he took over at Newcastle in 2010.